Looking for luxurious accommodations near Disneyland and Knott's Berry Farm at an affordable price? This deluxe Anaheim hotel offers all that and more. Located in the center of all the action in Anaheim, the area offers so much - and so do the modern, spacious rooms that were newly remodeled. Guests will love the extra special touches when staying at Best Western Plus Stovall's Inn, such as room service, free high-speed Internet access and cable satellite television with the Disney Channel and HBO Family . After a great night's rest, get the perfect start to your day with a complimentary full breakfast before you head out and enjoy the many area attractions. Just blocks from Disneyland , Disney's California Adventure and Downtown Disney , delight and wonder are never far from this Anaheim hotel. But, the excitement doesn't stop there - travel just a few miles more and you can enjoy visiting Block of Orange, Knott's Berry Farm , Discovery Science Center, Angel Stadium and Honda Center. Those traveling on business for area conventions and events won't have to travel far, as the Anaheim Convention Center is just a couple blocks away and Anaheim City Hall, UC Irvine Medical Center and Garden Grove City Hall are also nearby. 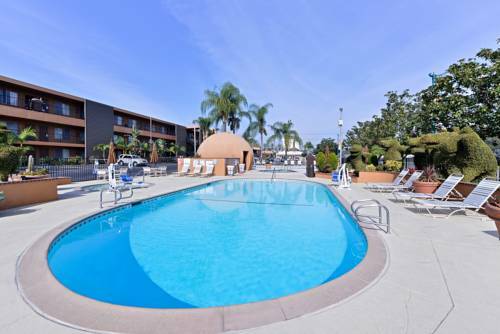 Traveling is easy, as John Wayne Airport is less than a half an hour from this Anaheim hotel. Two serene, sparkling outdoor pools and hot tubs as well as a children's wading pool allow you to play and unwind without even needing to leave the premises. Get even more out of your stay with added amenities at this Anaheim hotel, including an exercise facility, a business center, topiary gardens, a convenience store, a 24-hour front desk, sightseeing tours and Disney Park Hopper tickets for purchase.